Surrounding the sun is a vast atmosphere of solar particles, through which magnetic fields swarm, solar flares erupt, and gigantic columns of material rise, fall and jostle each other around. Now, using NASA's Solar Terrestrial Relations Observatory, scientists have found that this atmosphere, called the corona, is even larger than thought, extending out some 5 million miles above the sun's surface -- the equivalent of 12 solar radii. This information has implications for NASA's upcoming Solar Probe Plus mission, due to launch in 2018 and go closer to the sun than any man-made technology ever has before. These STEREO observations provide the first direct measurements of the inner boundary of the heliosphere -- the giant bubble sparsely filled with solar particles that surrounds the sun and all the planets. Combined with measurements from Voyager 1 of the outer boundary of the heliosphere, we have now defined the extent of this entire local bubble. Scientists used these observations of the sun's atmosphere (the bright light of the sun itself is blocked by the black circle at the middle) from NASA's Solar Terrestrial Relations Observatory on Aug. 5, 2007, to define the outer limits of the solar atmosphere, the corona. "We've tracked sound-like waves through the outer corona and used these to map the atmosphere," said Craig DeForest of the Southwest Research Institute in Boulder, Colorado. "We can't hear the sounds directly through the vacuum of space, but with careful analysis we can see them rippling through the corona." The results were published in The Astrophysical Journal on May 12, 2014. The researchers studied waves known as magnetosonic waves, and they are a hybrid of sound waves and magnetic waves called Alfven waves. Unlike sound waves on Earth, which oscillate several hundred times per second, these waves oscillate about once every four hours -- and are about 10 times the length of Earth. Tracking magnetosonic waves showed DeForest and his team that the material throughout this extended space remained connected to the solar material much further in. That is to say that even out to 5 million miles from the sun, giant solar storms or coronal mass ejections can create ripple effects felt through the corona. Beyond that boundary, however, solar material streams away in a steady flow called the solar wind -- out there, the material has separated from the star and its movement can't affect the corona. Realizing that the corona extends much further than previously thought has important consequences for NASA's Solar Probe Plus because the mission will travel to within 4 million miles of the sun. Scientists knew the mission would be gathering information closer to the sun than ever before, but couldn't be sure it would travel through the corona proper. 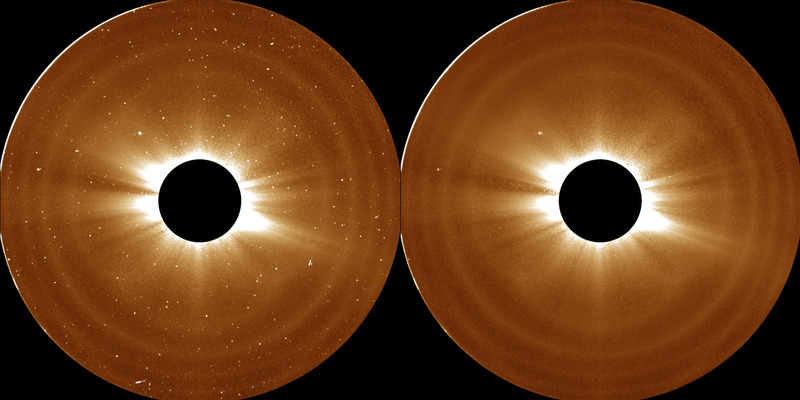 Highly processed movies from NASA's Solar Terrestrial Relations Observatory show wave motions moving downward through the solar corona toward the sun. "This research provides confidence that Solar Probe Plus, as designed, will be exploring the inner solar magnetic system," said Marco Velli, a Solar Probe Plus scientist at NASA's Jet Propulsion Laboratory in Pasadena, California. "The mission will directly measure the density, velocity and magnetic field of the solar material there, allowing us to understand how motion and heat in the corona and solar wind are generated." With direct access to the sun's atmosphere, Solar Probe Plus will provide unprecedented information on how the solar corona is heated and revolutionize our knowledge of the origin and evolution of the solar wind.